Arena is a large open-aired stadium in the Imperial City where gladiators fight to the death. The Arena was first built by the Blademaster Gaiden Shinji in roughly 1E 490. Shinji was a member of the fierce Order of Diagna, a band of elite crusaders sworn to protect the Empire of Alessia. Tiber Septim later declared this arena the official Arena of the Imperial City and had it restored to its former glory. 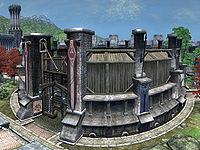 With Kvatch and its arena destroyed (the ruins of which can still be seen when you travel through the city), the Imperial City's arena is the only one left in Cyrodiil. Owyn serves as the current Blademaster. The stadium area is where the Arena matches take place and below it are the Bloodworks. The arena stadium is the circular outdoor area where matches are held. Inaccessible spectator stands circle all around and two observation balconies stand to the north and south. The southern balcony is used when watching a match that's being bet upon. Four bottles of cheap wine are kept here on three tables. There are four gates through which combatants can enter the arena, although only the northern and southern gates lead to the Bloodworks and only the northern one can be opened. In the center of the arena, four columns surround a large circular grating through which blood can seep out of the Arena and into the Bloodworks. Two different cells are used when watching a match and when fighting. Because the cell used when fighting is oriented 180 degrees to the spectating version, it is easy to get disoriented. The Bloodworks serve as an underground training and recruitment area beneath the Arena. They are so named as blood from the Arena above often seeps down to this lower level. When you first enter, there is a poster, featuring pictures of the Battlemage, Mage, Knight, and Archer classes. This is where you can meet a few of the combatants and become one by speaking with Owyn. An array of training equipment has been set up in the main room, along with two bedrolls in the west end of the room, near the enclosure where Porkchop is kept. An iron longsword is embedded in the ground near the foot of one of the bedrolls, and though it is not visible it can be picked up. A table between the columns on this end of the room holds a single bottle of Surilie Brothers Wine. Two weapons racks sit against the curved northern wall; one holds three iron warhammers, and the other holds two iron claymores. Either of the first two doorways on the curved wall leads to a room where Owyn can be found to the east and Ysabel Andronicus to the southwest. Behind Owyn a weapons rack holds two more iron claymores and a cabinet holds five heavy raiments and five light raiments. A letter lies crumpled on the floor beside the cabinet. In the west end of the room are two more bedrolls and another raiment cabinet with the same contents as the first one. A food cupboard sits next to the raiment cabinet and three non-respawning clutter sacks lie between them. Another cupboard holds the Athletics skill book The Ransom of Zarek. A gate between Porkchop's enclosure and this room leads to the Arena proper and the Basin of Renewal at the bottom of the ramp replenishes Health, Magicka, and Fatigue after matches. The text along the Basin reads: "The Best Techniques Are Passed On By The Survivors, Gaiden Shinji, Blademaster. First Era 1E 946". 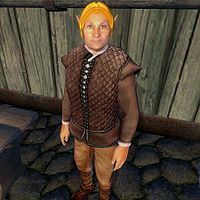 To bet on an arena match talk to Hundolin, who can be found in front of the Arena every day from 9am to 9pm. He will allow you to place a bet of either 25, 50, or 100 gold on either the Blue Team or the Yellow Team. After betting on a team, you must go into the stands to watch the match and its outcome. If the combatant for the team you bet on wins, you will receive twice the amount you bet from Hundolin after speaking to him again. The two competitors have the same level and are randomly equipped from the same equipment lists. Invisible walls around the spectator area prevent you from interfering with the battle in any way. There is one way in which the chances are skewed: your Luck level determines the health of the two fighters. If your Luck is 49 or less, the two competitors will have equal health. Otherwise, the health of whichever combatant you bet upon will be increased according to the following table. The calculation is based upon your modified Luck level, taking into account any fortify, damage, or drain effects. Note that there are a couple of coding glitches: there is no health bonus if your Luck is exactly 99; nor is there any if your Luck is greater than 100. Arena: Fight for money... and for your life. It is possible that the Arena was originally intended to be in Chorrol, as the actual betting area is named "ChorrolArena" in the editor and nearly all of the parts to make the Arena have the prefix Chorrol in them. There is also a cell named "AnvilArenaMain" in Anvil, which is centralized outside the walls. However, no other traces of an Arena can be found in Anvil. It is presumed that the developers decided to change the location to the Imperial City because of size restrictions in Chorrol and Anvil or just because it would seem more fitting in the Imperial City. It is not recommended to watch a match as a Vampire during the daytime, as there is no way to leave until the fight finishes and in the advanced stages of Vampirism it is not possible to survive that long without high health and powerful healing spells and potions. Due to the game's autosaving, you will be stuck in a loop until you load a previous save. The spectators outside of the balcony that are cheering actually are not NPCs. Presumably, they are just animated objects. A clear indication of this is that if you manage to approach any of them, they will completely "ignore" you. This is the only instance of "fake" NPCs ever seen in any Elder Scrolls game. There is a wall which can be walked through just to the left of the arena gate. It can be used to fight enemies through without being hit. Esta página foi modificada pela última vez à(s) 16h39min de 17 de março de 2015.